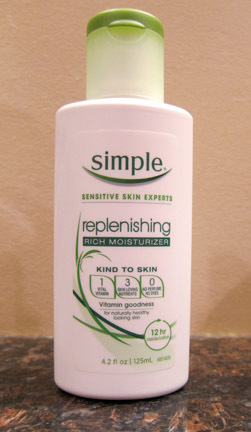 THE SKINNY: Simple's replenishing moisturizer is creamy and cool, perfect for a little extra moisturizing during the cold months of fall and winter. It's definitely thicker, but it soaks in quickly. It feels great on my skin each morning, whether it's paired with a serum or not. This moisturizer is made with Pro-Vitamin B5 to promote softness, as well as glycerin and other ingredients to nourish and calm redness. My only complaint is that this product doesn't have a sunscreen built into it. KEEP OR TOSS: Keep. I really like how this lotion feels on my skin. CHECK IT OUT: Simple also makes a lighter, hydrating moisturizer if you don't need that extra boost.